Click here to schedule a FREE 15 minute consultation with Stephanie to find out if homeopathy is right for you! Post 1 – Why are homeopaths and their clients so secretive in Facebook Groups about remedies for chronic conditions? Today’s question is: Can we do homeopathy along with other modalities, such as biomedical interventions or (insert other modality here)? I like it because it gives me the opportunity to get on my soap box about how many modalities are out there and how amazing they can be, either in conjunction with homeopathy, or alternating with homeopathy. But I dislike it because the answer is sooooo veeerrrryyy graaaaay. And we, as humans, often don’t like “gray”, especially in a crisis. We JUST.WANT.AN.ANSWER…..PLEASE!!! The short answer to this frequently asked question is: yes! 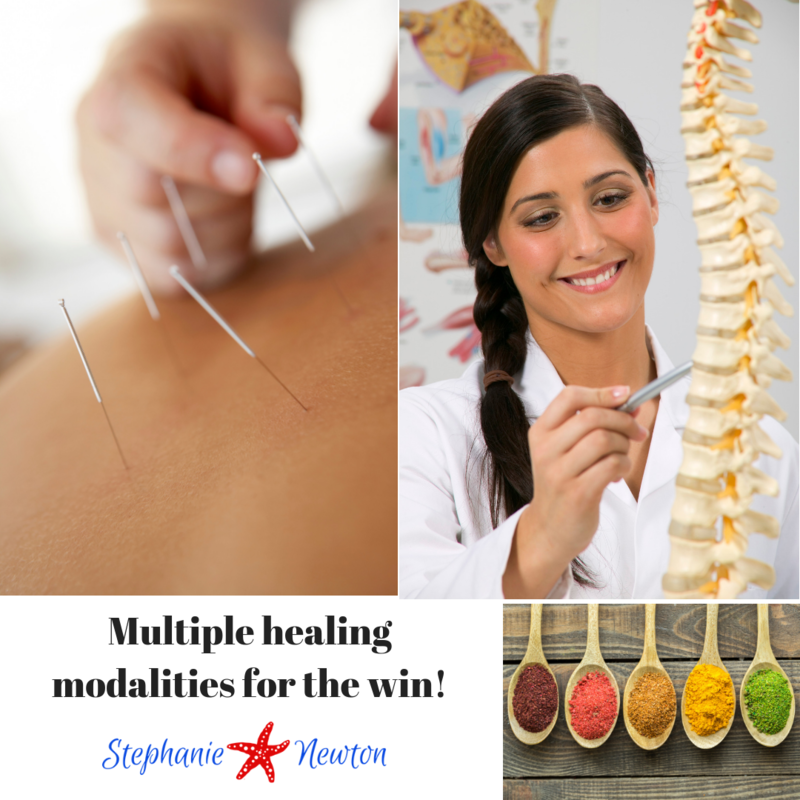 Combining or using several modalities over time can yield amazing results! Yes. You can do homeopathy along with biomedical and other interventions. In fact, please do! But with that said, I have a few caveats to throw out there. Let’s explore them one-by-one. Homeopathy can initially take you on an up and down rollercoaster, and may require frequent communication with your homeopath. Homeopathy, just like other modalities, can either start out subtle (um, I’m not sure it’s working…?”), or it can come in with a miraculous bang. And then there is the big detox reactions. Throw in there another modality and we (client and practitioner) will have a hard time telling which end is up! 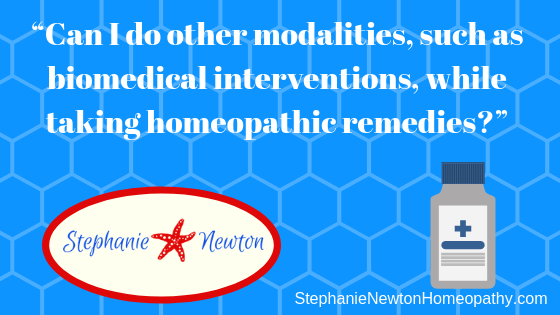 Homeopathy can be hard enough to navigate in the beginning, let alone deciphering what is doing what with multiple modalities. ESPECIALLY if your case is complex…because not only are we doing a constitutional remedy but also a nosode and possibly a detox clear. Phew! That’s a lot in and of itself! So separate the start dates of modalities. I’d say by at least 6 weeks. Really, the best way to know when to add in the next modality, is when you feel that you and the homeopath have figured out a protocol which has you on a relatively-upward trajectory, and you have gotten past the initial bumps and blocks in the road. Another consideration: which modality is my body calling for right now? Have you ever heard of Body Code? Some would call it “woo-woo”, others swear by it. Basically, a Body Code practitioner uses a detailed list or chart to narrow down for you which modality (and sometimes specifically which remedy/herb/supplement, etc, within that modality) you need right now. They do this through muscle testing. Either directly on the client or by distance muscle testing. What is my point? Maybe you don’t want/need a Body Code practitioner (I am not one but I dabble a little for my clients), but you should be tapping into that intuition and feeling into where you are being pulled next. Is there a modality that just keeps calling to you, or coming across your radar? Do you wake up and the first thought that enters your mind is a modality that you feel you should be exploring? Are you plagued by incessant thoughts of this modality as you are doing laundry (ok, maybe I am the only one this happens to lol)? Follow that “guidance” or hire someone to do some muscle testing so you know where to go next! Here is even some more gray for you. Sometimes you may narrow down just which modalities are the most helpful for you or your child (and there maybe be several). Great! Does it mean that you should be doing them together? Perhaps. And perhaps not. Maybe some can be done together and others should be done separately. Last year I discovered a miracle modality for my youngest son. While he had been steadily improving in many areas with homeopathy for many years, he was still struggling with some language issues and some other things. At first, I noticed several amazing benefits that he never received using homeopathy and biomedical interventions…or even chiropractic. One of the benefits was that his conversational ability went through the roof! For the first time in his decade of life he was able to express his feelings and thoughts on a deeper level than just getting his basic needs met or telling very simple stories such as “the neighbor has a cute dog”. WE FINALLY HAD CONVERSATIONS! The type of conversations that allow you to get to know each other! Oh, my heart!! As a side note, my son has a condition called Chiari Malformation which is a condition related to the shape of the skull bones (it’s not a visible malformation, but affects the cerebellum at the base of the skull). I believe this is why he was such a big responder to craniosacral therapy. Anyway, about a month into craniosacral therapy I noticed some big, bad, sad emotions coming to the surface. Some hopelessness and helplessness that was putting him into a state of despair. Why did this happen? Well, any modality can release trapped emotions which have been holding you back on a cognitive or physical (or emotional) level. I believe my son was grappling with emotions he had never really been in touch with (or never been able to express until now, so he developed the practice of “shoving them down”). It took me awhile to put all this together but I finally realized that what he needed was a homeopathic remedy at this point for deep depression. I gave him one dose and the “despair talk” went away immediately. Do you see how these two modalities worked together, yet separately? I was really not giving him any remedies during the first month of craniosacral therapy. I was just letting this modality do it’s magic. But then I believe the sessions were starting to work on deep layers (as all modalities eventually do) and the remedy was brought in to help resolve those deep layers. Would he have resolved those deep layers without that remedy? Probably. But it may have taken a much longer time. A few months later what happened was very interesting. He suddenly started refusing to go to craniosacral sessions. I was very disappointed at first, because up until that point, missing a session meant him having a noticeable regression in some of the gains that it brought him. But I was not going to force a very strong 10 year old into the car for a 30 minute drive. And what was interesting is that this time he did NOT regress after stopping his sessions. And shortly after that I started having very vivid dreams about small changes I needed to make in our environment for him. One of the changes that kept coming to me was to start the Nemechek protocol (inulin, fish oil, olive oil). I was getting messages and signs everywhere I turned about this protocol. I started the Nemechek protocol and low and behold, more gains! This is an example of “modality bouncing” via intuition and “signs”! First craniosacral therapy, then homeopathy, then Nemechek protocol. If you have any sort of spiritual practice, you may realize that God (the universe, whatever name you have for it) does speak to us in mysterious and subtle ways. The key is to listen and have enough faith to take the next step. His “modality of choice” these days (besides homeopathy which he is still very responsive to), is chiropractic. Why chiropractic? I believe it’s because his school forces him to carry around a backpack that I can barely lift off the floor (full laptop required in class! ), and because he is extremely active with impact sports. His spine is constantly being pulled out of alignment. So sometimes with remedies we will just get….stuck. Then we go to the chiropractor and he is at a new level of functionality once again! Another powerful modality for him is sleep. He’s 14 and NEEDS.HIS.SLEEP. Never underestimate the power of copious amounts of sleep at certain points in our lives. What is my point to all of this? You may find yourself having to bounce around between several modalities: taking a break from one and doing another, doing two together, using one to unblock the other, using a new modality to overcome a plateau in healing, etc. What has been my experience with clients who use multiple modalities? 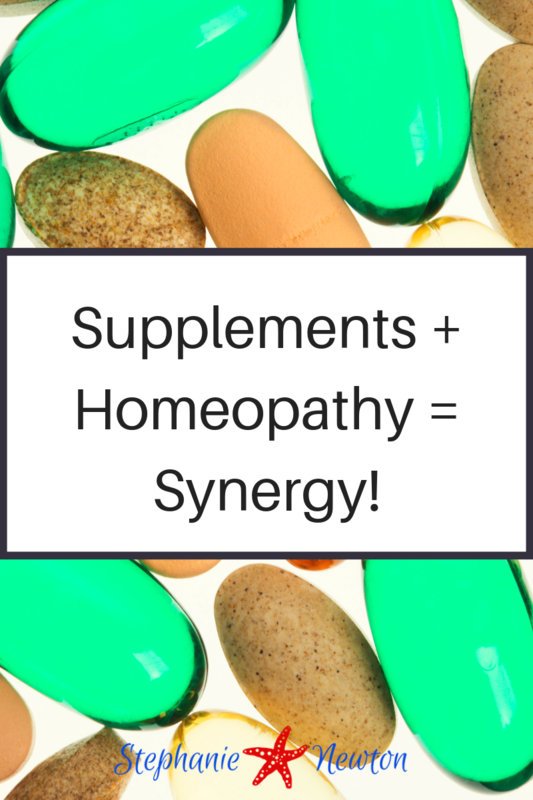 When the start dates of modalities are spaced out as much as possible, we see great gains and much less confusion along the way (allowing me, or your homeopath, to sort out and piece together one homeopathy protocol after the next, addressing layer after layer). Families that do rely upon more than one or two modalities generally get more mileage in their healing. There are times when we will make progress but then we notice a plateau. I will be honest with clients at this point and suggest exploring other modalities. That doesn’t mean our time together is done, it just means I am feeling like you need something else to “unblock” the case and then we can maybe make more gains with the next protocol. Sometimes “unblocking” the case can be done with homeopathy. But sometimes it cannot. I will often help clients figure out which way to go or which modality to add. So after recovering from the disappointment of not getting that oh-so coveted yes or no answer to this FAQ, I hope that you found value in my observations, experience, and opinions regarding combining modalities. Healing is a very unique journey for each individual. It can have its starts and stops and plateaus, and even setbacks. There can be times when you have no idea which direction things are moving. I think the more guidance you can seek and receive from the “divine”, the less confusion there will be along the way. And sometimes the “guidance” does not come exactly when you want it. I like one of Deepak Chopra’s mantras: sit with the questions, and the answers will come. Have faith that the answers are coming. Try to enjoy every step of the way. Try to go within and discover what lessons are being brought to the table through hardship and illness. I promise you there is a purpose in all of it. Find balance between doing (researching and trying modalities) and being (finding the good in where you are right now). This will allow you to slow down and be patient and allow healing to occur in its own time. Click here to schedule a FREE 15 minute consultation with Stephanie to find out if homeopathy is right for you! Share this article!